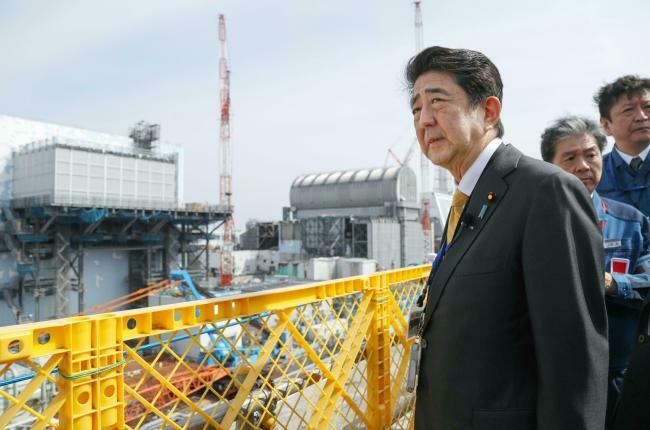 The visit by Abe, who last went to the Fukushima Dai-ichi plant five years ago, was seen as damage control after Yoshitaka Sakurada, a ruling party minister overseeing the Olympics, resigned for a remark appearing to belittle reconstruction in northeastern Japan. "Our basic policy is that every minister is a reconstruction minister," Abe said during his visit. "We reaffirmed our commitment to work for the revival of Fukushima and northeastern Japan." Abe wore a business suit as he was shown around the plant -- a contrast to the special head-to-toe suit and mask visitors had to wear five years ago, reflecting progress with the cleanup. He also visited a soccer facility called J-Village, which temporarily served as a place for workers dealing with the plant accident. A giant tsunami in March 2011 set off meltdowns at three of Fukushima Dai-ichi's reactors, the worst nuclear disaster since Chernobyl. As many as 160,000 people evacuated the area, although some have since returned. Earlier Sunday, Abe visited Okuma, one of two towns that house the plant, where an evacuation order was partially lifted earlier this month.